TDS stands for “Total Dissolved Solids.” Solids might also called dissolved minerals, ionic species, or salts. TDS is usually measured in ppm (parts per million) or mg/L (milligrams per liter), which are essentially the same. TDS is, in short, a measurement of all the dissolved mineral content of the water. A test for TDS does not measure chemicals or pathogens; a low TDS count does not mean that water is safe to drink. TDS is measured often by laboratories with a conductivity meter, which quantifies the water’s ability to conduct electricity. The higher the mineral content, the better it conducts electricity. For more practical purposes, a TDS meter, which works on the same principle, is used. Conductivity is read in micromhos per centimeter. The familiar TDS meter, an inexpensive and very handy tool, converts conductivity to ppm TDS for convenience. The TDS Tester is an effective tool that gives an instant reading of any water. Just turn it on and insert the bottom part of the tester into the water. More information. There is often confusion about TDS meters and what the readings mean. TDS meters measure the performance of reverse osmosis units, distillers, and deionizers, but except for limited use by professionals, they do not measure the performance of filters or water softeners. Softeners and filters do not affect TDS readings significantly. A softener, to illustrate, removes calcium and magnesium ions but the TDS reading will not be affected significantly because the softener adds a more-or-less equal amount of sodium in exchange. The TDS reading of softened water is usually slightly higher than the TDS of the untreated water. You need a hardness test to judge softener performance, not a TDS meter. Filters, especially when they are new, usually add TDS (the phenomenon is called “TDS throw”). Likewise, the performance of softener alternatives, either tank-style or electronic, cannot be measured by a TDS meter. Note that in standard usage these classifications are applied loosely. “Brine,” is used in water treatment for the salty water used to regenerate a softener or for the reject water from a reverse osmosis unit. In the case of the RO unit, the “brine” (a.k.a. “concentrate”) could be less than 50 mg/L in TDS. And although the song says that the moon was bright and shiny out on the briney, even sea water doesn’t technically qualify as brine. Similarly, saline often means any salty solution, and brackish is often used just to mean really bad water without specific reference to its TDS. The EPA suggests an upper TDS limit for drinking water of 500, although many cities exceed this limit without dire consequences. For residential water use, when water gets above 1,000 TDS it is starting to border on being unusable, although some well owners grit their teeth and put up with problems like badly stained fixtures, stopped up plumbing, or water so high in sodium that it isn’t good for plants. Actually fairly high TDS water can be usable but it isn’t pleasant to deal with. Hardness does not always result from high TDS. In our area in Texas, for example, much of the well water is high in sodium but naturally soft. If water has a TDS of 600 and a hardness reading of 2 grains (about 35 ppm), you can be virtually certain that it has a lot of sodium in it. If the high TDS consists mainly of calcium and magnesium (the hardness minerals), it can be softened, but the resulting water will be high in sodium. Treating low TDS is not common, but it can be done by using filters with a sacrificial medium like calcite. As water passes through the filter, it dissolves some mineral content and the TDS goes up. This can be done for point of entry (whole house) or point of use (drinking water only) applications. Small filters are now often used to “remineralize” reverse osmosis water. Minerals are dissolved by the low TDS water passing through the filter, raising the TDS count. Lowering TDS is done by reverse osmosis, the most common method used in residential settings, distillation, or deionization. Reverse osmosis reduces TDS 90%+ (99% for larger, high pressure units), while distillation and DI (deionization) units can reduce TDS to a zero meter showing. Filters do not reduce TDS, not even the extremely tight ones. 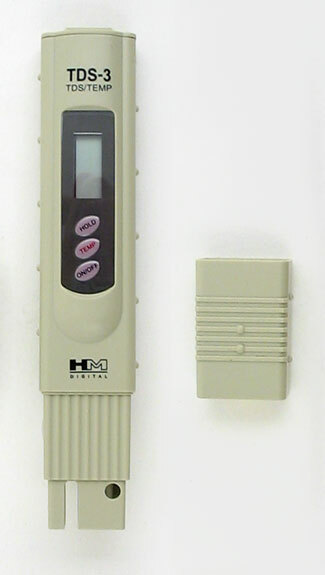 The main use for a handheld TDS tester is to verify the performance of your RO unit’s membrane. While TDS is not in itself a targeted “contaminant” like lead, arsenic, or nitrates, the TDS meter verifies the health of the RO membrane. If the RO unit is reducing dissolved solids by 90%, you can be sure it’s also doing a good job on aluminum and fluoride. The purpose of the TDS test is to tell you when to change your membrane. If you have an excellent TDS reading, that does not mean you don’t need to change your filter cartridges. The membrane should be changed on need—as indicated by the TDS test—but cartridges are changed on time. In fact, keeping the cartridges fresh is the best way to protect your membrane. The worst time to do a TDS test is immediately after changing your filter cartridges. The new carbon postfilter will produce a “TDS throw” that will make your TDS reading high. Take a TDS test before you change your cartridges. The same principle applies to new RO units. You won’t get a reliable TDS test until the unit is a couple of weeks old. If you want to test shortly after installation, take loose the tube going into the storage tank and take your sample there—before the water goes through the post filter. An acceptable TDS reading is a matter of personal preference. On our residential RO units, we usually change membranes when the unit consistently fails to reduce TDS by 85% or so. To determine this, test first the tap water from the faucet, then compare it with the water coming out of the RO unit. This is called “% rejection,” and the formula is TDS of tap water minus TDS of RO water divided by TDS of tap water times 100. To illustrate, our local tap water usually runs around 180 TDS. So, if we test an RO system that shows a TDS reading of 15, the arithmetic would be 180 minus 15 = 165 divided by 180 = around 9.16 X 100 = about 92% rejection. The best advice is don’t obsess over TDS readings from a home unit. TDS is somewhat fickle and can be changed by variables like water pressure and the amount of water being used. Don’t be too quick to change a membrane if you get one bad test.